Quite an overreaction to not reading my Tweets, but okay. Alt right commentator Laura Loomer was banned from Twitter for spreading hate speech earlier this month, joining Richard Spencer and Milo Yannipoulis as some of the alt right figures who got banned for basically saying a lot of very racist stuff. This banning follows on the heels of Laura Loomer losing her Verified status. The Jewish alt right commentator then joined Gab, the same openly bigoted message board that played host, and defended playing host, to the man who shot up the Pittsburgh synagogue, killing eleven Jews. 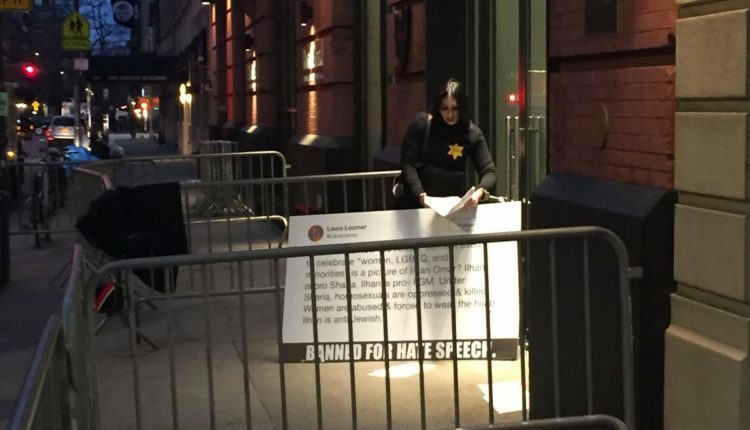 However, that didn’t seem to satisfy her, and in what has to be the most ineffective protest we have seen to date, Laura Loomer, wearing the yellow star worn by those in the Holocaust in a very dramatic reaction to not being allowed to read my Tweets, has handcuffed herself to the doors of the Twitter building. 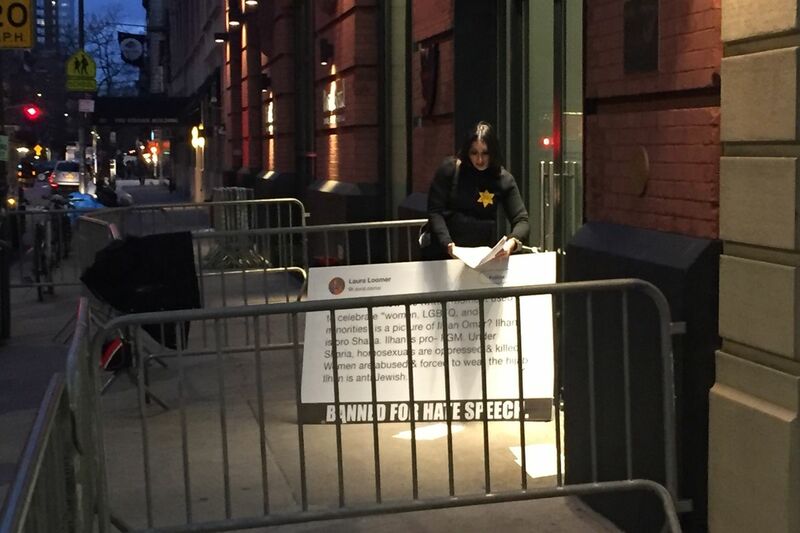 laura loomer handcuffed herself to the doors outside twitter. the doors still work and other people can go in and out. she literally locked herself out of twitter through her own actions. is this the meaning of her elaborate art installation? Twitter is overrun with videos of Laura Loomer handcuffed to the building and the reactions are… not good. While some far right organizations, wishing to play up the false idea that Twitter shadow bans Republicans (not really a real thing, and more a concept created to drum up sympathy for Twitter by Twitter’s more alt right figures), have sympathy, for the most part the internet has been absolutely merciless making fun of Laura Loomer whose very dramatic protest has been playing to laughs and crickets. THE RIGHT: this is nothing like the the Holocaust everyone calm down. The police have come by, and Twitter made the very smart choice to not indulge Laura Loomer’s desire to be a martyr, not arresting her and letting her stay chained to the door as long as she wants to be chained to the door of the Twitter building. So uhh. Good luck Laura Loomer! I don’t know if being Jewish on Gab is a ton of fun, and I don’t think invoking the Holocaust because you can’t @ reply articles with hate speech any more is a great thing to do! Whatever! What do you think of Laura Loomer’s crappy protest? Let us know in the comments or on Twitter at @WhatsTrending.